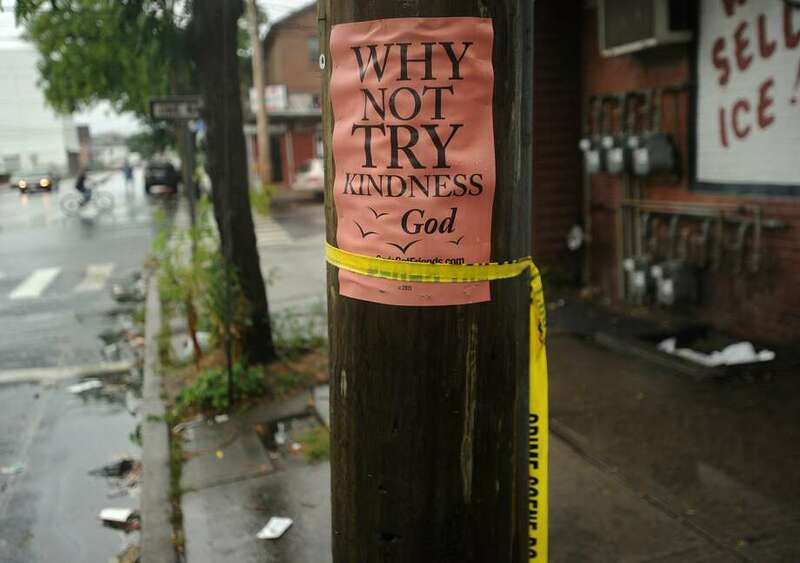 FILE PHOTO — Police tape hangs off a utility pole marking the spot of a homicide early Monday morning at the intersection of Stratford and Union avenues in Bridgeport, Conn., on Monday, August 13, 2018. That question prompted passersby in the area of Stratford and Union avenues on Monday, Aug. 13. The question was on a salmon-colored flyer, posted on a utility pole at the problematic intersection in the East End. That crime scene tape was left behind by detectives who were at that intersection for several hours investigating a shooting that left one man dead. Len Smith, 25, who lived on Fourth Street in the city, was fatally shot while sitting in the front passenger seat of a car parked outside Sunshine Deli on Union Avenue. A 33-year-old woman sitting in the back seat was critically injured. She was shot in the head. No arrests have been made, but the investigation into the shooting remains active. After the shooting, police said Smith and the woman were likely not the intended targets. And after that homicide, Bridgeport Police Chief Armando Perez decided enough was enough. “I promised the community that I was going to be very vigilant over there, that I was going to make sure that they were safe and try to prevent this from happening again,” Perez said Thursday. Perez said a major problem on that corner is the bodega that is open 24/7 — the Sunshine Deli. On a frigid day in March, community and city council members gathered twice at the bodega to plead with the owner to close his doors for a few hours every night instead of being open around the clock. Firyad Quadir, the owner of the Sunshine Deli, insisted his business didn’t cause the problems that plague the Stratford Avenue area. The area outside the store has been known for drug deals, shootings, public drinking and loitering. “Work on cleaning that up before you blame the store,” Quadir told Hearst Connecticut Media that March morning. Later in the day, during a phone call with state Rep. Andre Baker, D-Bridgeport, Quadir agreed to start closing his store at 9 p.m. every night. But Perez said that didn’t stick. So now, Perez said he has had officers patrolling that area 24/7. He said there has been a two-officer patrol assigned to the area around the clock since Smith’s killing. Perez said the officers pull up for their patrol, parking their police cruiser directly outside the bodega. “I really want to have a real police presence there,” Perez said. The officers walk up and down the avenue and its surrounding streets, tapping into the community policing aspect of the job that Perez has been a strong advocate for. City Councilman Ernie Newton praised the patrols. The officers patrolling in that area rotate, but Perez hopes to soon have a more permanent staffing option in place so residents become familiar and more comfortable with the faces they see. But Perez doesn’t want to stop there. He teamed up with some members of the city council to get a city ordinance passed that will require all bodegas to close up shop every day by 11 p.m.
Newton and City Councilwoman Eneida Martinez are working with Perez on the ordinance. Newton said the city is looking to mirror a similar ordinance that is in effect in New Haven. “Those areas where you have a lot of activities — like people being shot — are the focus points,” Newton said. City Councilwoman Eneida Martinez said the “nuisance ordinance” will mirror one that has been in place in Patterson, New Jersey, since 2017. The ordinance will require bodegas, bakery shops, meat markets and any other business selling food or grocery products to obtain a permit to be operational. With this permit, Martinez said, places like Sunshine Deli would have stipulation that indicates the facility must be closed by 11 p.m. each day. “We want people to feel safe,” Newton said. Perez took a trip out into the area of the East End on Thursday to reassure the residents that the police presence in the area was not going away. The nuisance ordinance will go before the City Council Ordinance Committee on Sept. 25. If it passes the committee, it will go to the City Council for a vote. If it is passed by the City Council, it will become effective immediately.